ANSO’s annual program consists of a number of two-day working-level symposia co-located with local chapters. The symposia are designed to provide members with career management support and one-on-one mentoring sessions with senior officers and senior enlisted members who volunteer their time in support of their shipmates. 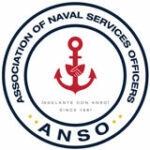 Our ANSO 2018 Eastern Region Symposium (ERS) will be held at the United States Coast Guard Air Station Miami, located inside the area of the Opa-Locka Executive Airport, 14750 NW 44th Court, Opa-Locka, Florida on 03 and 04 December 2018. Please note that our 2018 ERS will be two days in duration. The agenda and registration for the ANSO 2018 ERS is on line via this website. Please contact your Service Diversity Officer today for further information and to obtain one of these sponsorships PRIOR to registering online. Five years ago, we changed our year-long program to a series of periodic, regionalized, one-day professional mentoring and career development symposiums and we have seen an increase in overwhelmingly positive feedback from our symposium attendees. Based on that positive feedback, specifically an increasing need in our mentoring program, I have increased the duration of our symposiums to two days (two two-day symposiums per year, one per region). As we continue to focus each of our symposiums on our primary mission – mentoring and career management in growing leaders (Officers and Enlisted) for the future of our sea services – with onsite mentoring that is closely aligned to individual key career milestone events, our symposiums have achieved great success and participation along with an increased propensity for attendees to continue to serve in uniform. Moreover, our renewed efforts fully support the continuing leadership development programs of the Navy, Marine Corps and Coast Guard. My secondary mission is community outreach. Remembering that we truly expect our Sea Services to reflect the “face of our nation,” especially in our senior leadership ranks – Officer and Enlisted, not only do we concentrate on mentoring our Hispanic Shipmates of today in order for them to become our leaders of tomorrow, but we also continue to grow and nurture the youth of today to be our leaders of tomorrow. Our ANSO Chapters have been very active in supporting their local Hispanic Communities and School Districts. Your participation and support are key to the success of our program. The focus of our Mentoring and Career Development Symposiums are for you – our next generation of Sea Service Leaders. It is our aim to help you become the best qualified candidate for promotion and for leadership positions in our Sea Services. For Attendees: Please bring your Performance Summary Records, FITREPs, OERs, Evals, etc so that you can make the most from this symposium and your one-on-one mentoring. This is especially important if you are close to coming before a promotion or selection board! You will need to contact your Sea Service Diversity Office to obtain one of these sponsorships BEFORE registering online for the symposium. If authorized by your specific command, other TDY costs and per diem costs may be secured through your individual command. 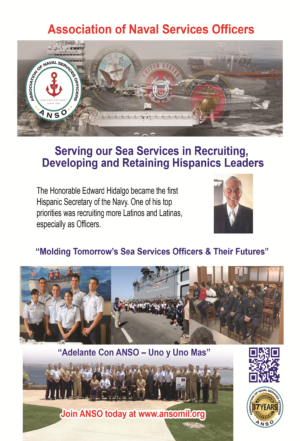 2018 ANSO ERS Theme: : Molding Tomorrow’s Sea Services Leaders and Their Futures! ANSO is very sensitive to our current fiscal environment, and we do not want to be a fiscal burden on our members and the Sea Services. As you may know, starting in 2013, we revamped the way we execute our mission through a series of one-day professional development symposiums. In addition to reducing costs by 96% from the annual conference construct to our regional symposium construct, my goal throughout every year is to conduct at least two one-day symposiums – one in each one of my regions (Eastern and Western). Specifically, we have continued to focus each of our one-day symposiums on our “main thing”: Mentoring and Career Management in Growing Leaders (Officers and Enlisted) for the Future of our Sea Services, with actual onside mentoring that is closely aligned to individual key career milestone events, e.g., promotion boards, selection boards, etc. To date, our symposiums have resulted with great success and participation. Moreover, we have taken advantage of today’s technology and social media to broadcast our symposiums to our non-regional members via our new website – a website that continues to inform our members of the latest career management and mentoring thoughts and ideas of the day. Finally, our renewed efforts fully support the Navy’s “Line of Effort” – to “Strengthen our Navy Team for the Future” (from “A Design for Maintaining Maritime Superiority”, Version 1.0, January 2016) in helping the Navy, as well as the Marine Corps and Coast Guard, with our continuing leadership development programs. Since the change in our annual program, and after four years of conducting two one-day symposiums per year, we have seen an average of 85 persons in attendance (given the average attendance of 39 Coast Guard personnel, 36 Navy personnel, and 10 Marine Corps personnel) and an average cost of $7,376 per symposium. After analyzing the costs associated with our symposiums, starting in Fiscal Year 2017, we have increased our $75 rate per attendee per day per symposium to $100 per attendee per day per symposium. In addition to the fee increase, and based on the overwhelming positive feedback from our symposium attendees, starting in FY17, I am also increasing the duration of our symposiums to two days. This duration increase will support the need for further one-on-one mentoring sessions, as well as general ANSO membership business. Moreover, we will continue to conduct two symposiums per year. As a reminder, in comparison to when our annual program consisted of one three-day conference that cost approximately $380,000 for 400 attendees, commercial venue costs, etc, our new program of two two-day symposiums per year is only 9% of the three-day conference per year – a 91% reduction in overall costs. Closely aligned to our primary mission is my secondary mission which is community outreach. Remembering that we truly expect our Sea Services to reflect the “face of our nation,” especially in our senior leadership ranks – Officer and Enlisted, not only do we need to concentrate on mentoring our Hispanic Shipmates of today in order for them to become our leaders of tomorrow, but we also have to continue to grow and nurture the youth of today to be our leaders of tomorrow. Therefore, our ANSO Chapters have become very active in supporting their local Hispanic Communities and School Districts. For planning purposes, our Western Region Mentoring and Career Development Symposium has been merged with our Eastern Region Mentoring and Career Development Symposium. Our next symposium will be held at the United States Coast Guard Academy in New London, Connecticut, on 12-13 September 2017. You must register in advance for our Symposiums. Our Sea Services (Navy, Marine Corps and Coast Guard) Diversity Offices are in full support of our symposiums and will fund a certain number of registrants from their respective Services. Before registering on-line via our ANSO Website (www.ansomil.org), please confirm your attendance with your respective Diversity Officer. In order to make the most of these symposiums, please bring your evaluations, fitness reports, and other performance records with you when you attend the seminar. ANSO’s Regional Mentoring and Career Development Symposium brings together Hispanic officers, civilian executives, enlisted personnel, and other senior leaders in the Navy, Marine Corps, Coast Guard, and maritime industry to learn from, network with, and mentor one another, as well as conduct professional development training. Our diversity efforts will focus on identifying, recruiting, and retaining Hispanics in our Nation’s Sea Services, and on establishing community outreach programs that will develop close relationships with Hispanic centers of influence. Participants are encouraged to share ideas and experiences, network, and enjoy the benefits of a great professional leadership conference. Our main purpose is to ensure that you are fully qualified for promotion and selection as you proceed up your respective career ladders. There will be one-on-one mentoring sessions at our symposiums, so make sure you sign up when you first arrive at the event. We will receive service updates from the Sea Service Chiefs (if available). All activities are designed to support you in improving your professional development and providing guidance on overcoming challenges while celebrating your achievements.